41 arrivals for the period. Whitefish totalled 14,500 boxes from ten Scottish trawlers and five Anglo Spanish liners. The Scottish trawlers continue to enjoy very productive squid fishing at Rockall with boats landing weekly. The Anglo vessels are starting to drift further south as is the case at this time of year when the hake catches start to dwindle. Shellfish picked up a bit with increased prawns and crabs on the grounds. The brand new Oban-based scalloped Summer Rose called in for a half landing and to pick up some stores. Non-fishingwas busy again; the naval support vessels called in for a layover, the fishfarm tug Sally Ann and landing craft Ossian calledin for equipment and live wrasse respectively. The cruise liners Seabourn Quest, Silver Wind and Nautica all made scheduled day calls in perfect weather conditions. One of the 2018 Harbour Projects reached its conclusion last week. 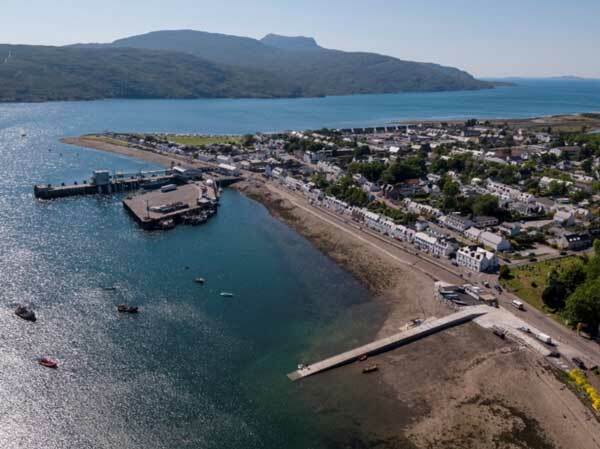 The Wee Pier renovation and enhancement was completed and handed over on Thursday 28th June by Lochshell Engineering who have done a fantastic job. The slipway structure which was in danger of collapse due to years of constant seawater erosion has been stabilised, refurbished and given a new lease of life and the surrounding hard standing areas have been enlarged and surfaced. The sale of this much-prized local asset by Highland Council to UHT is still in the balance after twenty months of emails; it is hoped that the £5,000 deal will be concluded in the next two weeks to enable the harbour to recover the outstanding grant funding. The slipway and new drying-out area are free to use by all-comers but when launching boats please ensure your vehicle and trailer is removed to allow others the same level of access. Boats, dinghies, trailers and vehicles which obstruct access will be removed by the harbour Manitou if necessary. It’s hoped that the jetty will grow into an even more useful resource and that both locals and visitors alike will use it for work, recreation, education and training. The Community Workshop and Changing Place floor coverings will be laid this week and thereafter the lights and plumbing hardware will be fitted and the building decorated. The harbour has finally signed off on the lease with Highland Council after eight months of negotiation. The Shellfish Store and Landing Derrick are both complete and it is hoped that before long the crab catches will pick up and the new facility will come into its own.